Tulsi, known more commonly as holy basil is an incredible plant that has many health benefits. From strengthening your immune system, to fighting stress, lowering high blood pressure, and mitigating conditions like diabetes, Tulsi can do it all! But wait, theres more: Tulsi is also commonly used to relieve acne and pimples - what can’t Tulsi do? 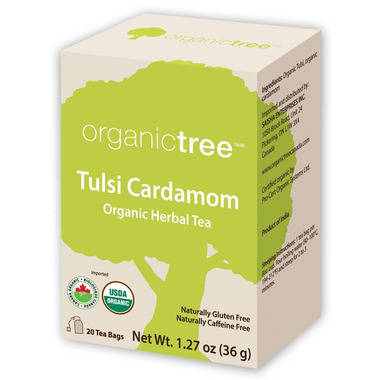 Coupled with Cardamom, known for it’s innumerable health benefits, this tea is sure to put a skip in your step. Not only does cardamom have antibacterial properities, but it also has strong antioxidants that help people suffering from anemia. Cardamom is a cancer fighter, as well as aiding in detoxification, which is great news for your kidneys! In other words, this tea will make you unstoppable! Pretty good flavour and aroma. I would buy this again.